For the past three decades, the contemporary jazz format has notably stood out from other genres of popular music in its stability and consistency. True, the style has picked up its fair share of influences from modern R&B, hip-hop, and even pop at various points in time; but for the most part, the underlying paradigm of melody-centric tunes played in fundamentally relevant instrumental fashion has remained intact. This commitment to authenticity has been displayed in the long-spanning careers of key figures in the field, running the gamut of vocalists (Michael Franks), horn-players (Paul Taylor), guitarists (Marc Antoine), and ensembles (Fourplay). Still, it’s a small group of creators that both laid the groundwork in the early days and continues to make waves today. Chiefly among that select society, Pieces of a Dream has been an ever-present, always reliable force to be reckoned with. Spanning genre-defining ballads (“Warm Weather”), rap-induced grooves (“Mt. Airy High”), clever and funky vocal numbers (“Fo-Fi-Fo”), Pieces’ 1980s output paved the way for essential ‘90s and 2000s CD’s such as In Flight, Love Silhouette, and Pillow Talk. And while the group (now comprised mainly of pianist James Lloyd and drummer Curtis Harmon) continues to build on its legacy, Lloyd is taking a moment to showcase his individual prowess on the impressive solo set, Here We Go. Longtime fans of Pieces will not be disappointed, while newer recruits to the world of smooth jazz might just discover a talent with whom they haven’t yet been acquainted. Here We Go shines the spotlight on easily flowing instrumental pieces with just the right amount of pep. The focus is on Lloyd’s versatile keyboard work, which sounds right at home within a selection of songs that is consistent in theme and feel, unconcerned with trendiness or flashiness. Opening with the breezy, motivating title cut, Lloyd displays an appreciation of solid, steadily building melody lines that interweave naturally with the supporting players’ embellishments. Similarly, the percolating “Moving Right Along” stands out thanks to his knack for style and subtlety, which works right into the effortlessly kinetic rhythm track. On the slower and more contemplative side, there’s the charming “Granted Wish,” bearing spare rhythmic elements and a familiar-sounding refrain ideal for winding down to; while the graceful “Almost There” strips away the usual guitar and bass accompaniment in favor of light layers of keyboard and synth colorings. 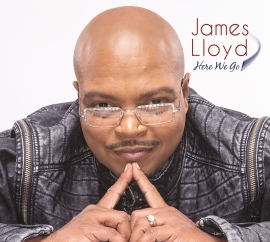 In addition to his own musical impetus, Lloyd acknowledges and brings a cool spin to the work of several other prominent figures on Here We Go. He incorporates his funk leanings on the groovy and determined “For the Duke in Me,” a finger-snappin’ ode to the late George Duke evoked with lively, church-y ostinatos complemented by super-steady, scratchy guitar lines. Meanwhile, the cannily titled “Much O’Blige’d” pays homage to the Queen of Hip-Hop Soul with a swingin’ melange of vocoder-esque stylings, pliable beat patterns, and sparkly synth overtones. These two cuts are a distinctive way to round out the album, as they deviate a bit from the concentrated smoothness of the remaining repertoire, but stay close enough to the collection’s understated core to make for an inviting conclusion. Given the invaluable legacy of Pieces of a Dream’s recorded contributions to contemporary jazz, one can only hope that the outfit will continue to release new fare for loyal listeners and supporters. Simultaneously, however, it’s exciting to hear such a well-crafted and merited collection as Here We Go as sonic evidence of the individual capabilities of one of the group’s founding members. With ample consideration and respect for his musical past residing comfortably alongside a clear vision of his own artistic sensibilities at this moment in time, James Lloyd has begun a colorful new journey with his first album as a soloist. Recommended. Connect with Justin on Twitter.